London’s most notorious murderer walks its streets once more. Whitechapel, 1917. Jerry Reinhart, an American fighter-pilot, returns to London to convalesce after losing an aerial joust with the German ace, Baron von Richtofen. Sick and unstable, he loses himself in the seedy streets, unaware that he has brought back something unspeakable with him from the Western Front. Something that begins to take on the shape of a killer who was never caught. 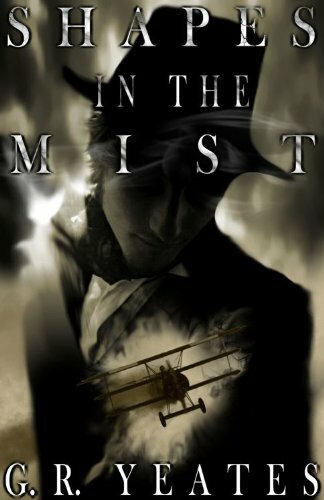 As the bombs rain down on old London town, a man named Jack is being reborn. After reading the first novel in the cycle, The Eyes of the Dead, and being thoroughly ruffled by the read, I’ll be really honest and say I somehow expected this one to go for the same “horror sweet spot”, to use the same tools of disturbia. I was dead wrong, no pun intended. Of course, this is a sequel to the first novel in the cycle, but I can honestly say you’ll have just as much fun reading it on its own. Out of all the scary things I could have found lurking in there, waiting to pounce me, Jack wasn’t one of the ones I would have expected. It thrilled me that G.R. Yeates blended historical mystery with horror and suspense in such a masterful way. Where the scary elements of the first book were pretty physical and certainly scary in a material way, let’s say, the scary stuff in the second book is more of the psychological sort. Of course, the blunt revolting is still present, though in this book we’re dealing more with a study of the hideous side of humanity. In this regard, I’ll confess to feel more at ease with the horror of this book rather then dread of the first. I find that the characters are also easier to identify with as a reader, up to a point, and in certain circumstances; you enter a human world, and the scary element infiltrates inside it, whereas in the first book, it felt more like the other way around. I wouldn’t necessarily say I had a fondness for any of the characters, well maybe for Jerry; but overall, the mystery and original mix of yummy elements gripped me so hard, I could have easily loved this book even if I would have hated all the characters. The point isn’t liking them, anyways, this is not that kind of book that hangs on how much you’ll like the character or characters. And for someone as character-oriented as I am when reading, that’s not something I get to say often about a book I loved reading. True, the style of writing might take a bit of getting used to, as I find it is not quite the facile sort. It seems to me more of the artful sort of writing, and I’m very aware there are those that have a grudge against careful, expressive wording. But we’re not talking classic flowery writing by any means, more of a mix between the easy-to-read style and a more luxurious one, rich in ideatic content. To me, this is perfect for a good, scary read. It’s very smart, engaging, original, and an all-around delight, plus I think this is the best season for it, isn’t it? Give it a try, it’s the good kind of spooky.